affidavit (see right) shows the names of Patrick’s parents. (With this information David Brown would likely have found the place of origin in Ireland. But then, he probably would not have written the letter to my mother and I would not be telling the story now.) Bridget did not live long after she and Patrick were married. She died about seven months after their marriage, and, two years before Patrick’s accident. 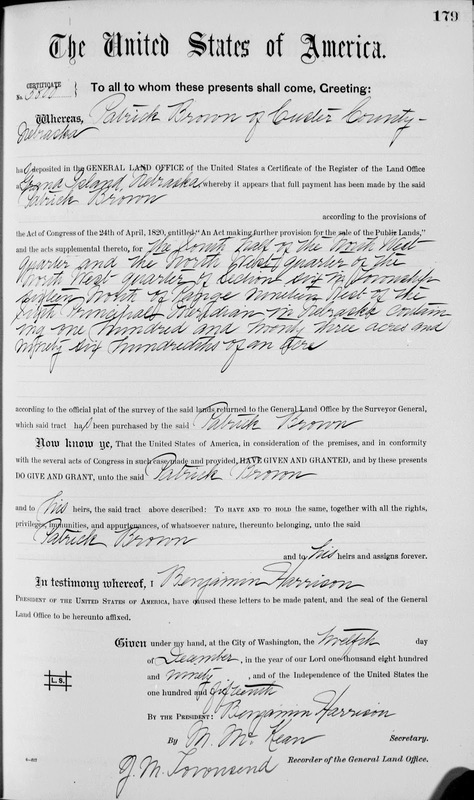 parents of the Brown children, (the original source was the death certificate for the youngest son, Thomas), the Petition for Letters of Administration (see left) gave the names of Patrick’s children and where they were living in 1891, providing even more information to trace Patrick and his family. It also contained the signature of John Brown, second son of Patrick, and provided a way to verify records for the rest of the children. It is very understandable why Nebraska was attractive to the Brown family. Patrick and Anne had four sons, Patrick, John B., David O., and James E. Farming aspirations for men without financial means would have been difficult in the Bloomington area. Land, if it was available, while very productive, was also very expensive. Patrick, the oldest son, married and stayed in the area around Bloomington, Illinois eventually working for the railroad. The other three sons moved away. Newspapers in the 1880s were full of information about “free” land available in the West. The Pantagraph in Bloomington carried one such story on the front page of its May 26, 1881 issue about “Nebraska’s Boom.”6 Stories were also carried in the newspapers about families visiting home who had previously taken advantage of lands available under The Homestead Act of 1862. First-hand knowledge would have been obtained from them. and farming some portion of the acreage, for five years, they could file for a final deed. If all requirements were met, they were issued a land patent for their acreage.7 Coming from the east where there was ample rain to sustain crops, the offer must have sounded very rich to many who would not otherwise have had access to land ownership. However, 160 acres of “dry prairie” where one bad season could wipe out an entire enterprise, posed a serious challenge for those not familiar with farming methods needed to succeed in those conditions. As a result, as many as 60% of applications were never completed.8 Other farms were abandoned, or sold after a short time. 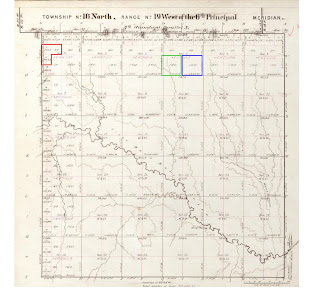 US Public Lands were mapped into a grid pattern using The Public Land Survey System (PLSS), making is easy to identify a specific location that could then be sold to individuals or “given” to homesteaders under the Homestead Act of 1862. 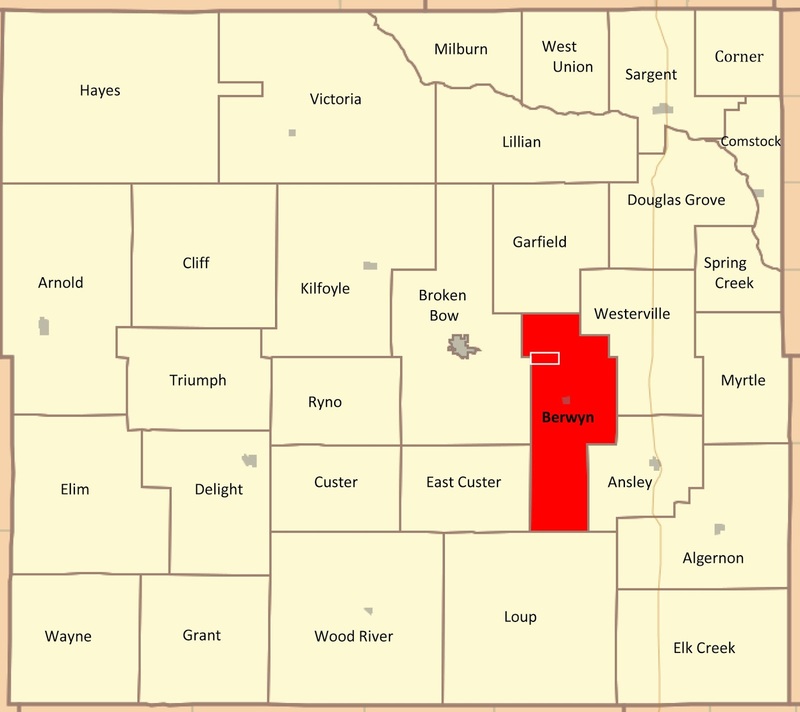 Each location contains a section, township, range, and meridian identifier.9 A section contains 640 acres and is further divided into fourths identified by direction, i.e. the NW¼ of section x. PLSS townships are identified by a number and should not be confused with civil townships used for local government that are always named. the Petition for Letters of Administration in the estate of his father, Patrick, verify this is the same person. (See application document right.) Other documents in the file detail improvements made to the property by the time he signed the final affidavit including a 14 x 24 sod house, two stables, one frame and one sod, a cellar, a well that was 107 feet deep, and a wind mill and pump tank. He also owned six horses, three head of cattle, seventy head of hogs, two dogs and one cat. Household furnishings are also listed. The final patent was signed November 1, 1890. 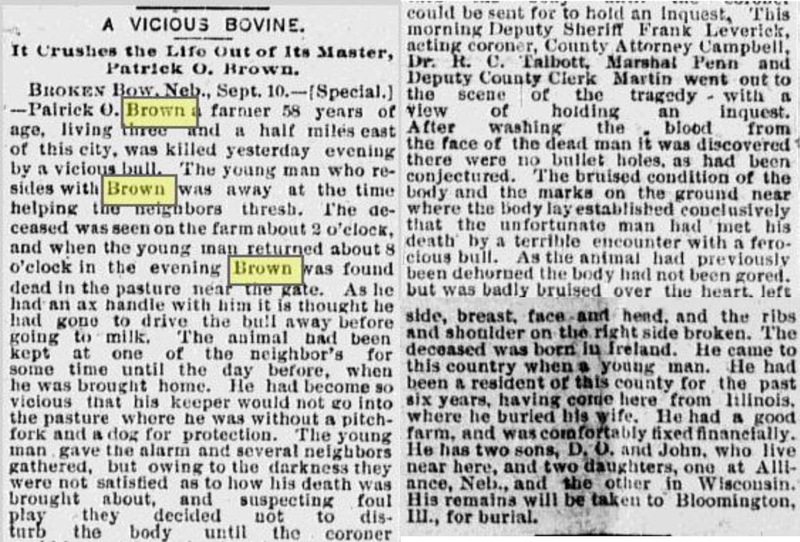 Patrick, the father of the John, David, and James, also settled in Berwyn Township west of John’s property and just a few miles east of the town of Broken Bow as described in the news article about Patrick’s death. 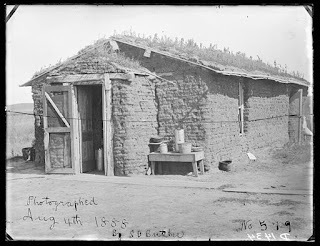 His homestead, (sec. 6, twp. 16N, range 19W), contained just 123 acres instead of the more usual full quarter section containing 160 acres. Part of this section may have already been sold, this may have been a more desirable location, or, since Patrick had downsized his Illinois property, he may not have wanted an entire quarter section. 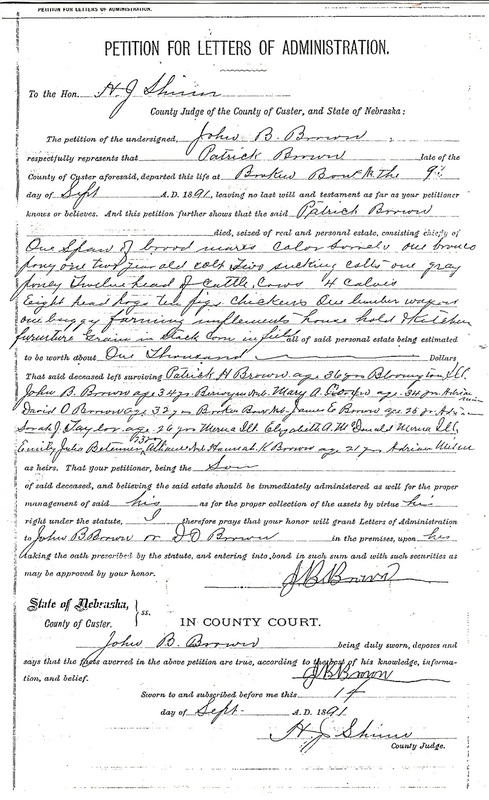 The final patent (see document left) is signed December 1890 making his entry into Nebraska at least December 1885. 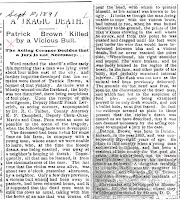 Unfortunately the original papers are not available online and would be interesting to see.14 Not only would the papers contain his entry date, but, since Patrick was foreign born, it would likely contain proof of his citizenship - when and where his naturalization took place. Records for Westerville Township also show a patent for James E. Brown in section 2, close to the homestead of David O. described above, that was finalized in March, 1890. James would have been just old enough in March 1885 (using the five year residency requirement) to have started the application process. Original papers are in the National Archives and are not immediately available to review. Because this is located very close to David’s place, it may be an indication of a relationship to Patrick, John and David. 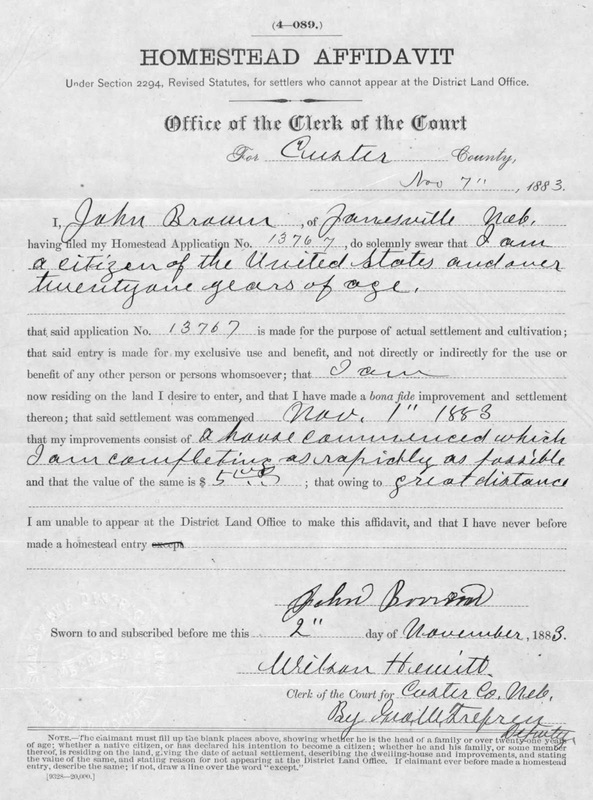 However, the “Petition” in Patrick’s estate file identifies James as living in Adrian, Minnesota at the time of Patrick’s death in September, 1891. An examination of original papers would be needed to make a final determination. even if they had taken advantage of the original Homestead Act. The only stipulation was that they plant trees on at least one-fourth of the land.16 David took advantage of this provision and acquired 160 acres bordering brother John’s homestead. See the geological survey map (right) of section six identifying the locations of properties for Patrick, David and John. Broken Bow along with her father and brother. David acquired public lands in this area also (sec. 29, twp 17N, range 21W). A map, indicating all possible properties associated with the Brown family, is shown left. 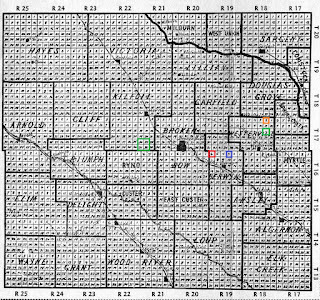 It is a survey map, showing sections, townships, and ranges, with civil townships for Custer County superimposed on it.17 Below is a summary of the Brown land patents. One final piece of information completes Patrick’s story. 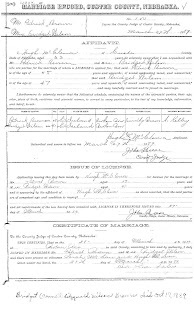 David was a witness at the marriage of his sister, Elizabeth, which took place in Merna, Illinois, just east of Bloomington, on September 28, 1884.18 According to his homestead application papers, David was living in Nebraska at that time. Perhaps David was visiting Illinois for his sister’s wedding and convinced his father and brother, James, to return to Nebraska with him? The dates in all of the application papers seem to support this. In the next post, we will take a brief look at the nine children of Patrick and Anne Burns Brown. 1. Brown, David Earl, Kewanee, IL, 11 May 1943. Letter to Esther ________, Columbus, OH. Letter contains genealogical information for the Brown Family from County Limerick. 2. 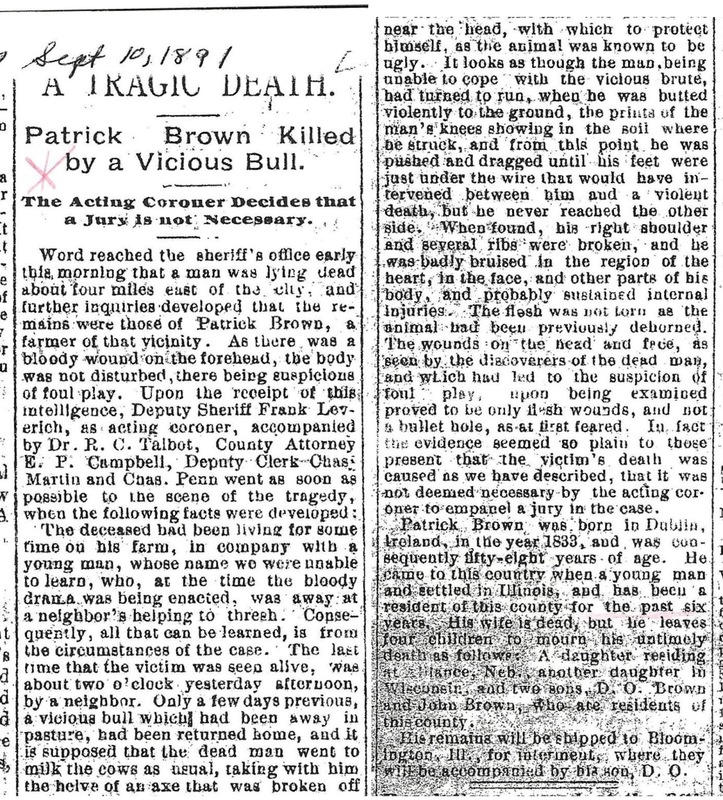 “A Tragic Death, Patrick Brown Killed by a Vicious Bull.” Custer County Republican, September 10, 1891. 3. Talk about serendipity! I called the Custer County Historical Society (CCHS) sometime around 2005. The conversation went something like this. Me: “I would like to request a copy of an article in the Custer County Republican.” CCHS: “We usually don’t take requests like this since it takes a lot of time to locate an article.” Me: “But, I have the exact date the article was run and the man died in unusual circumstances.” CCHS: “OK, we can try. What is the information you have?” Me: “Patrick Brown died September 9, 1891 and . . .” CCHS before I could finish the statement: “. . . and was killed by a bull.” Me: “Was the incident that notorious?” CCHS: “No, I’m working on a request from his wife’s family.” Me: “His wife Anne?” CCHS: “No, his second wife Bridget.” Me: “I didn’t know he was married a second time.” CCHS: “He was, but she didn’t live long. 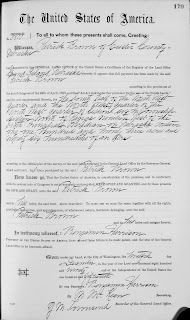 I have a copy of the Custer County marriage record. Would you like a copy of that?” Me, jumping for joy: “Yes!” CCHS: “We also have a copy of the ‘Petition for Letters of Administration.” Would you like that as well?” And so, I received information that helped uncover more of Patrick’s story. 4. 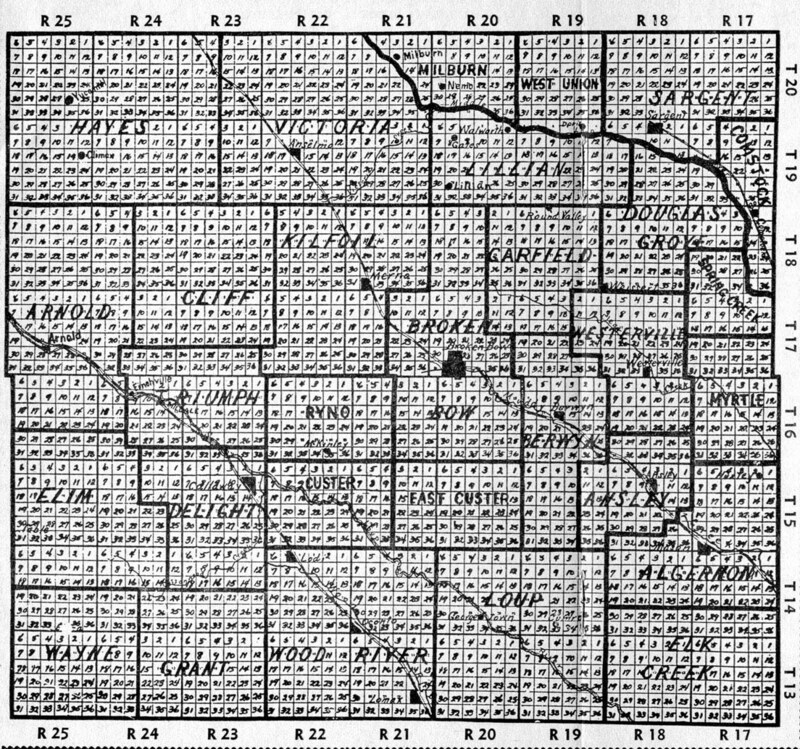 Marriage Record, Custer County, Nebraska, Mr. Patrick Brown to Mrs. Bridget Wilson, Custer County Records, Book 2, p. 100. The handwritten notation at the bottom is from the CCHS staff identifying the date of Bridget’s death. 5. Custer County Historical Society, copy of Petition for Letters of Administration for Patrick Brown who died 9 Sep 1891. I do not know the case number for Patrick’s Probate record. Custer County Nebraska probate records at Family Search are only available from 1930. Several months ago, I requested additional information about the probate record from the CCHS. To date, I have not received anything. When it is received, I will post the information on the blog. 9. See http://nationalmap.gov/small_scale/a_plss.html for a discussion of The Public land Survey System and how it is used to identify a specific piece of property. A section is a one square mile block of land containing 640 acres and is one thirty-sixth of a township. A township, always numbered in the PLSS, is a horizontal row of 36 sections, or a six-mile square area of land. A range is a vertical column of townships. A principal meridian is a meridian line (longitudinal) chosen as a starting point to section off a given area. All of Nebraska is in the sixth principal meridian. 10. Website for the Bureau of Land Management for General Land Office Records is available online at: http://www.glorecords.blm.gov/search/default.aspx?searchTabIndex=0&searchByTypeIndex=0. Identify the state you are interested in from the drop-down box, and also select the appropriate county. Type is the last name in the “Names” section and press “Enter.” A list of all persons by that name who completed the application process will be returned. 11. While Fold3 is generally a pay site, Nebraska Homestead Records are available for free at www.fold3.com. 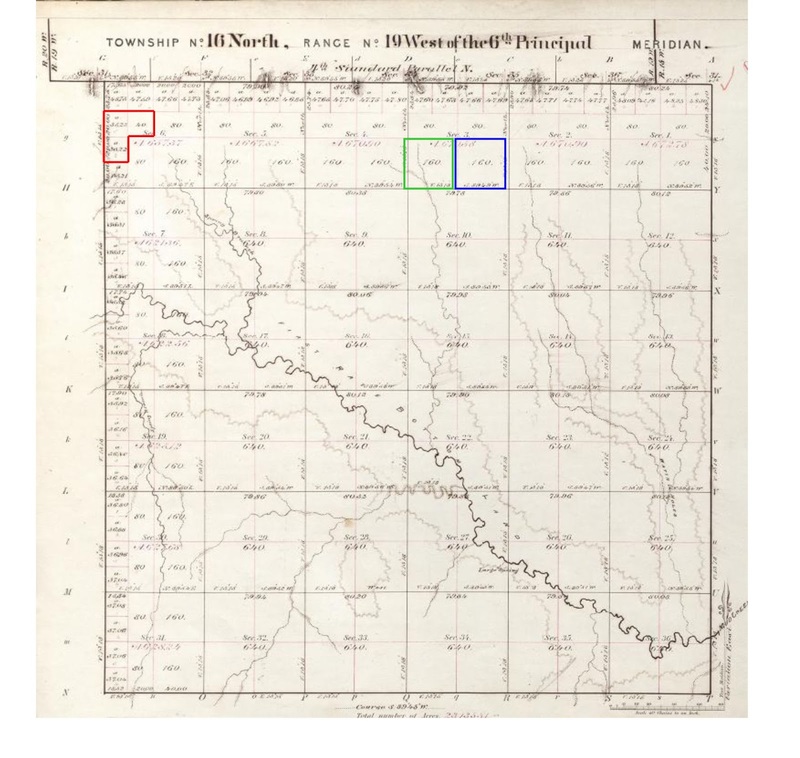 Select Non-military Records, then Homestead Records, Nebraska, select the appropriate Land Office (the name is shown on the final patent), then select the township, range, section, and individual’s name. 13. The application for John B. Brown is one of those available on Fold3 and is available online at: https://www.fold3.com/browse/253/hDe05rrWTdbrYn98ko3SsPzW7GAw8qARhIX6cEC5OTd53zRkuBAztzp6k ) Note that the original application shows the name of the town as “Janesville.” This was an earlier name for Berwyn. 14. Note: The definitive location of Patrick’s property cannot be determined until the original application can be reviewed. However, other factors, the proximity to James’ homestead, and the location of Patrick’s farm given in the news article, indicate this location. Moreover, only one Patrick Brown is shown in the land patents for Custer County, unless there is another application that was not completed. 15. There is another confirmed homestead for David in Kilfoil Township (section 29, township 17N, range 21W) online that contains David’s signature. Papers for this claim could be used to compare signatures. 18. 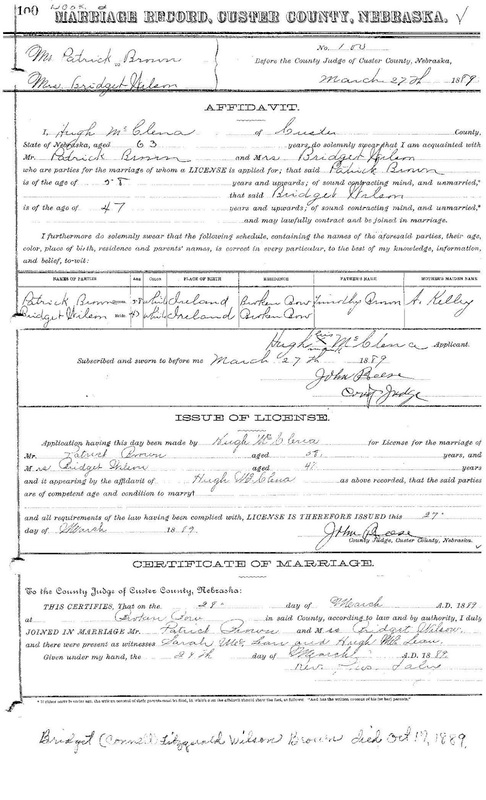 McLean County Illinois Marriage Register, Elizabeth Brown to John McDonald, Illinois Regional Archives Depository, Normal, IL. Once again -- I am so impressed. Thank you Mary Ann for continuing to provide us with valuable information. Your footnotes help me to understand better the procedure for doing effective research.